To do diving trip preparations are often collectively, as this profession should be carried out by a large group of individuals, and not easy to obtain them, which is supposed to be the majority of those individuals who have good practical diving and swimming. It Lattice, which places him Loon on his nose so as not to enter the water Geoffh protection from drowning during Ghosh to the bottom of the sea to gather shellfish. Mass of stones or bullets linked Loon in one of his legs during the designated landing into the deep sea. It Robe, which wear Diver during a diving operation, usually of fabric and of thick black color. A group established by the Loon gloves fingers in his hands during the gathering shellfish and shellfish at the bottom of the sea. 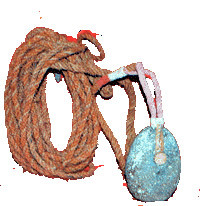 A bag which puts it Loon as his collections of oyster and Conch during each diving underwater, and attached the bag always Diver's neck during a diving mission. Rope is related between Loon and manned by the way brings to Loon board after each diving to the sea, and is usually long can even Loon move whereby the distance about a ship at the discretion to exist conch. It is a tool like a knife used by the sailors in the process of opening shellfish to search inside what if it contained the hidden or not.